Tune in to Afternoon New Music at 3 pm on Monday, October 23rd for an exclusive in-studio interview with composer/pianist Vijay Iyer. Iyer will discuss his new piece "Asunder," in advance of its New York premiere this Thursday, October 26th, 2017 at Carnegie Hall, where it will be performed by the Orpheus Chamber Orchestra. 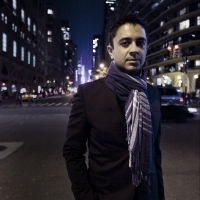 Grammy-nominated composer-pianist-scholar Vijay Iyer's career has spanned the sciences, humanities and arts. He has been voted DownBeat Magazine's Artist of the Year three times — in 2016, 2015 and 2012, and was named DownBeat's 2014 Pianist of the Year, a 2013 MacArthur Fellow, and a 2012 Doris Duke Performing Artist. Iyer has released twenty albums covering diverse terrain; his five most recent albums are on the ECM label. Orpheus Chamber Orchestra opens its 2017-2018 season on Thursday, October 26, 2017 at 8:00 pm with the New York premiere of Iyer's "Asunder." Iyer explains that "'Asunder' seeks to elicit unlikely or even impossible unities in the traditional orchestra formation. This objective is approached by reassembling instruments into unusual groupings while specifying a literal 'balance of power' among groups, and ceding a certain amount of control of the flow of events to the players."